Complete guide – The full manufacture’s guide for the Panasonic AC90 is available online. 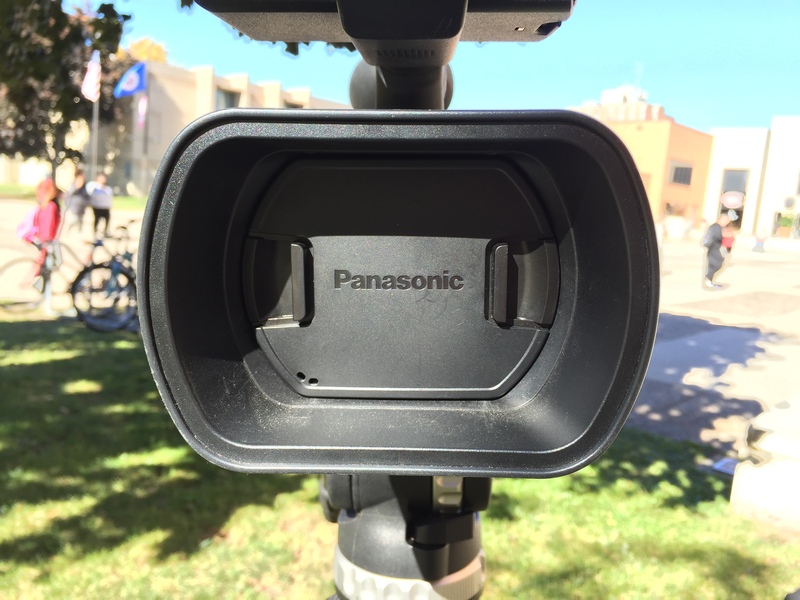 You will need the Panasonic AC90 Video Camera and tripod kit for COMM 240. A microphone, battery pack and SD cards will be provided. You will be checking the gear out and are responsible for return everything. Do not leave gear for the instructor to return. Return all the gear you check out, including the lens cap. 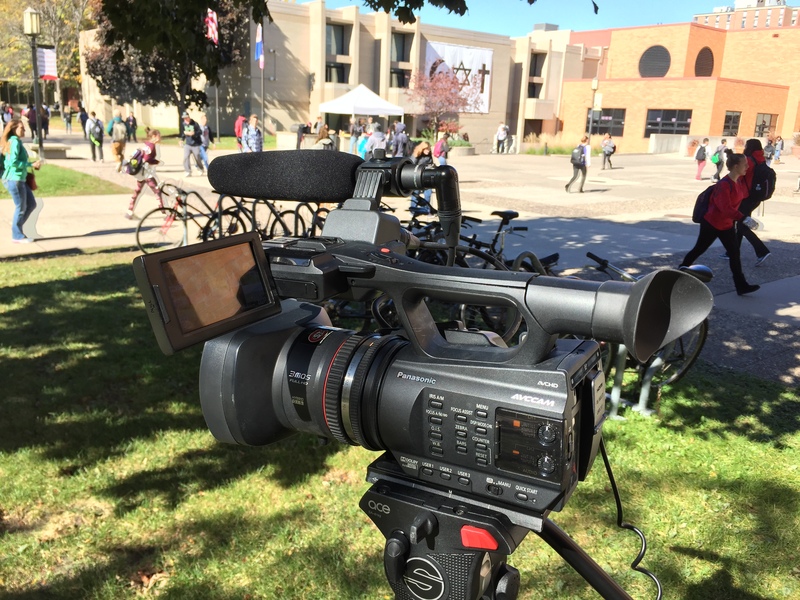 You can check out gear from the Mass Communications Department lockup or cage next to the office in Stewart Hall. Go in person and get details for gear checkout or call, 320-308-4782. They will help you will all details about checking out gear. 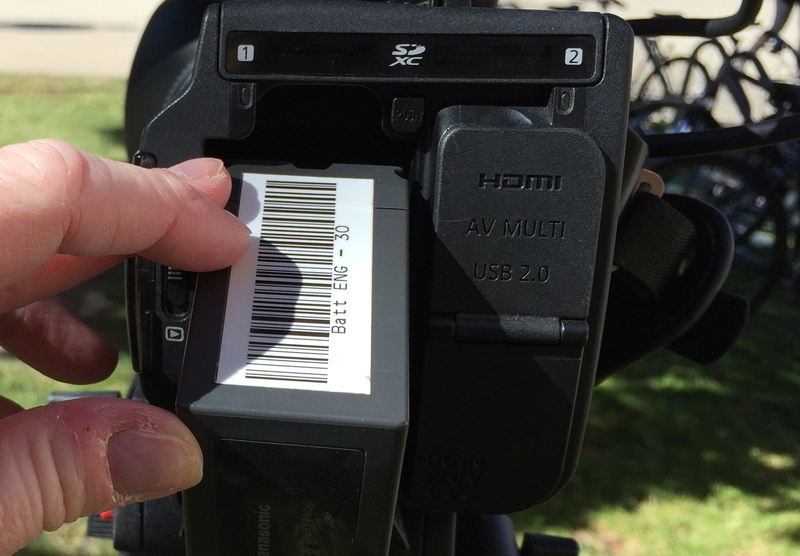 Installing battery – Install the battery, back of camera, with arrow pointing down. Listen for a clicking sound. 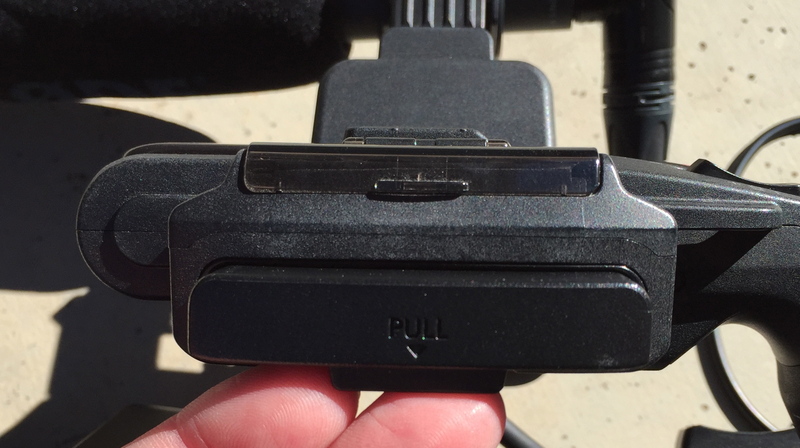 Slide battery pack into back of camera, following down arrow. Removing battery – Turn off the power switch to OFF. Press the battery release button, located battery. Take care not to drop battery. Turn on the power switch located on the right side of camera. Remove the LCD monitor on the left side of camera, it’s hidden during storage, and rotate it for easy viewing. Touch the LCD monitor, the Menu, then Record Format, PH 1080/60i. Then exit. Your recorded video is stored on the SD cards. There will be two cards in your camera when you check out your gear. 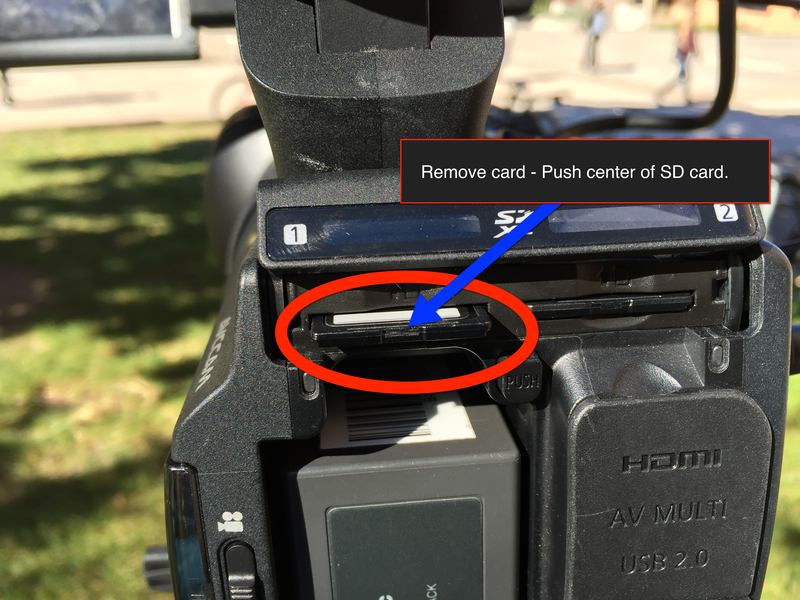 Insert Card – Face the label up on SD card. Insert cards in the card slots. There will be a clicking sound if inserted properly. Close the card cover to keep out dust. Remove Card – Press the center of SD card and card will pop out and will hear a click. Pull the card straight out and close the SD cover. 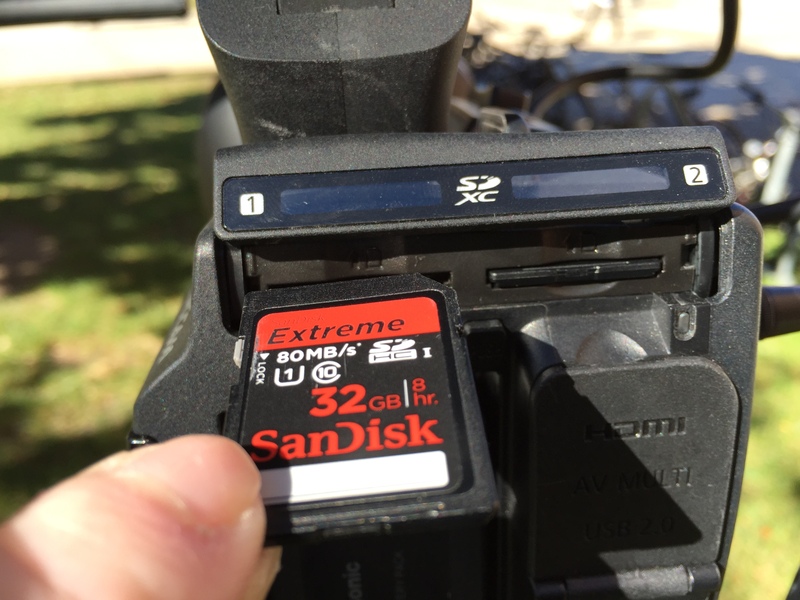 The SD cards must be formatted BEFORE you go out on a shoot. Proceed with caution – If you don’t format the SD cards, you will have the previous shooter’s video clips on the cards and you might not have enough storage room to shoot your assignment. If you don’t possibly mind re-shooting assignment, FORMAT your cards now! Remove the LCD monitor, if it’s not already out, and rotate for easy viewing. Press the MENU button on the monitor. 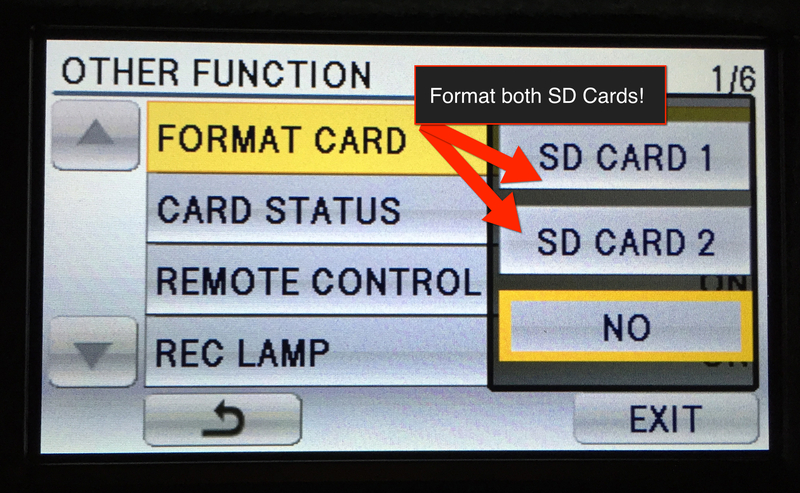 Touch SD Card1, allow for formatting, then repeat for SD Card2.Touch EXIT when formatting is complete. – Locate the mode switch on the back left side. 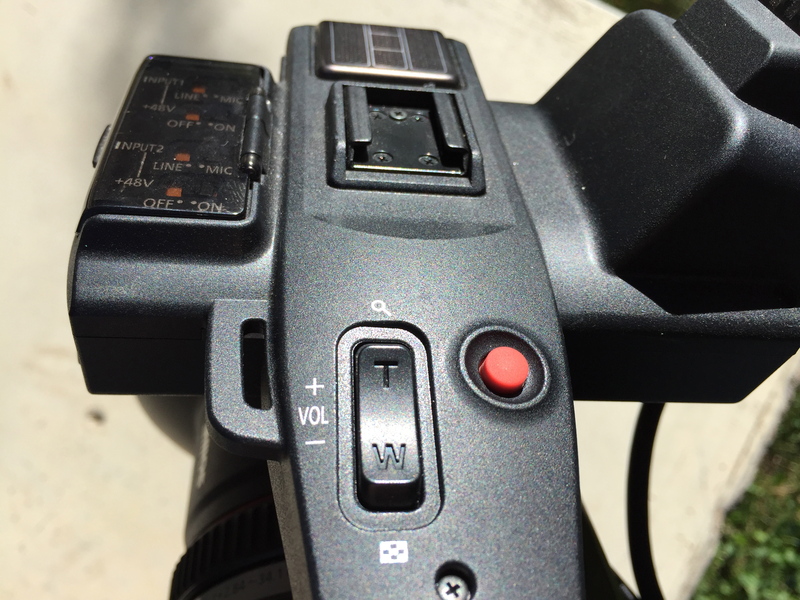 There is a switch for shooting video, image of a camera, and a playback mode button, used for reviewing video clips. 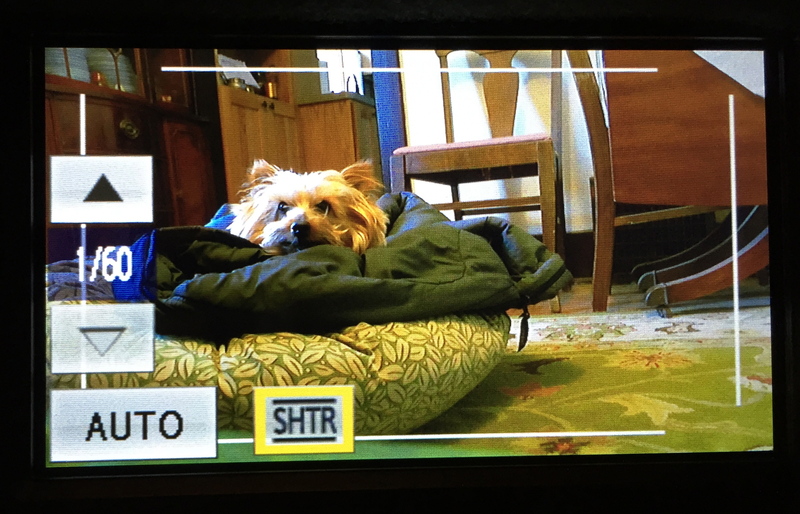 – Change mode to video, switch on back of camera, left side. Make sure camera is set to MANU(AL) – located on left side, bottom row of camera. 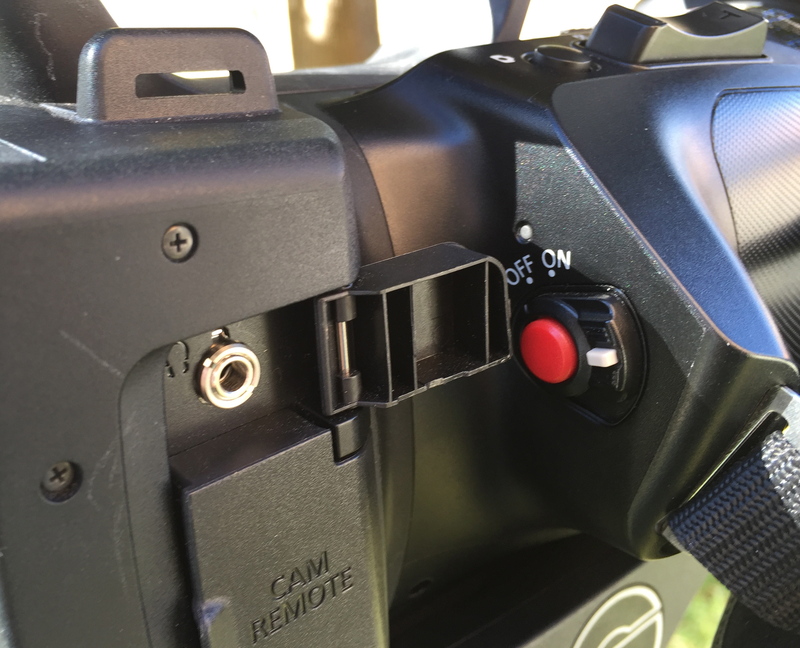 Switch power button ON, right side of camera, if not already ON. Press the record start button to start recording video and press the same button to stop recording. – Rotate the LCD monitor towards the lens side. Displaying during the recording yourself can be switched by setting SELF SHOOT. In the menu on the LCD, select ATW, and the white balance will start to be balanced in seconds. This is the automatic function along the same lines as the auto focus and auto exposure. It takes a few seconds to respond to the changing lighting conditions. See photo below to solve the most common issue with the ATW setting. 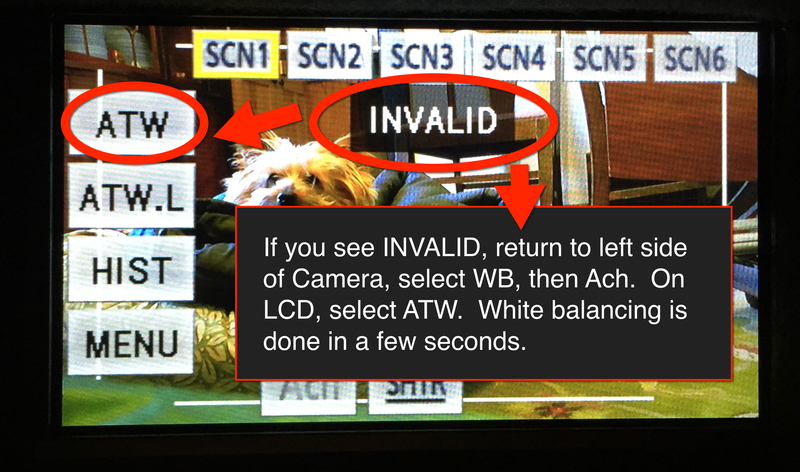 White Balance with white card – The Auto Tracking White Balance listed above is recommend, but see directions to set balance with a white card. 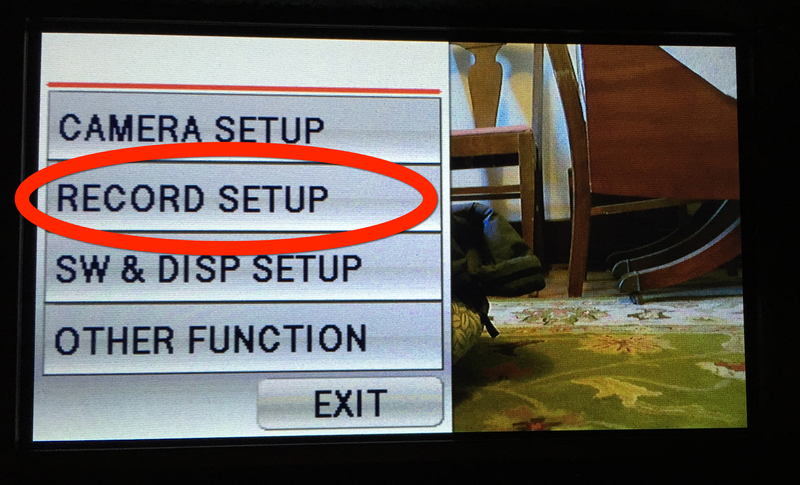 Switch camera mode to Manual, bottom row on left side of buttons. Press the White Balance, WB button. Press it several times until you see Ach. Hold the white balance card in front of the lens and zoom in so the lens is filled with the entire card. NOTE: You need to hold the card in the location where the subject is located, not just in front of the camera! Press and hold the WB button. The screen will go dark and will give a message that WB SET OK. If you are shooting fast moving subject, you will want to adjust the shutter speed. This also goes for TV Screens and computer monitor that to reduce flicker on your video clips. Touch the LCD monitor to display the operation icons and touch SHTR. Touch the up and down arrows to adjust the shutter speed. When the shutter speed is set manually, the speed will display below the frame rate. General guidelines: Keep the shutter speed at the default of 1/60. Cars, aircraft and other fast moving subject, set it at 1/120. NOTE: You will have to adjust camera with a wider aperture, the amount of light. The aperture is the opening in the lens that allows light to enter camera. The aperture is controlled by the iris, like the human eye. Wide open iris allows more light, need for low-light or darker situations. When the iris is stopped down, or allowing less light, when the shutter speed is set to high speed situations. The f-stops, the focal ratio, is the size of the aperture settings. The f-stops are a scaled with the smallest number having the largest opening. The F/2.8 is the largest opening and the F/16 has the smallest opening. Learn more about f-stops at Vimeo. 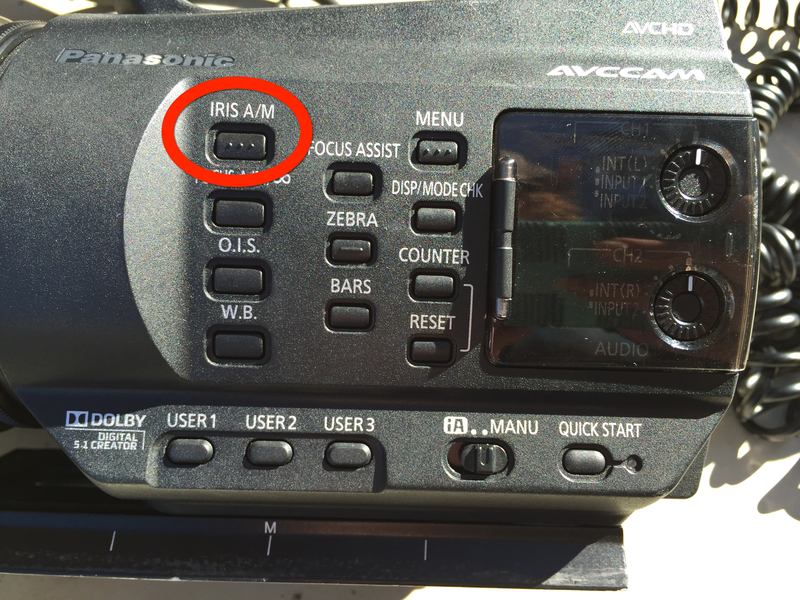 Press the IRIS A/M button to switch to manual mode. STD disappears on LCD monitor. Will see OPEN or an F-Stop setting. Turn the IRIS Dial, inner most black ring on camera body, to adjust the aperture of the lens. 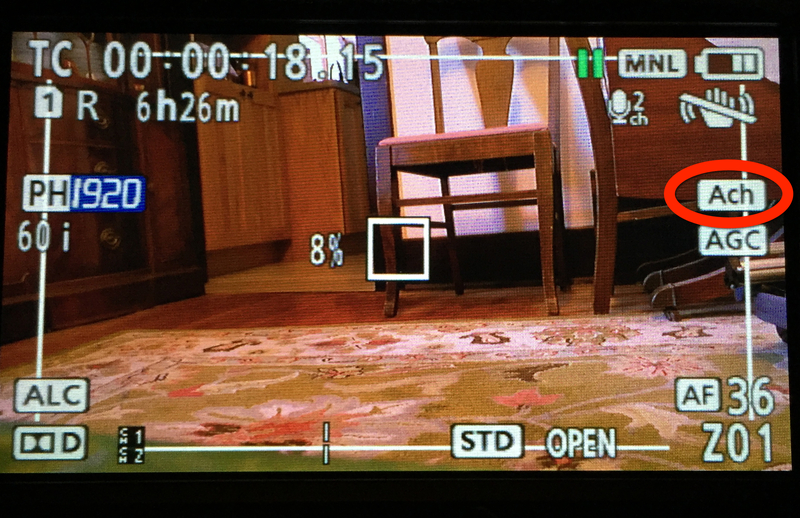 The f-stop appears on the LCD monitor and viewfinder. 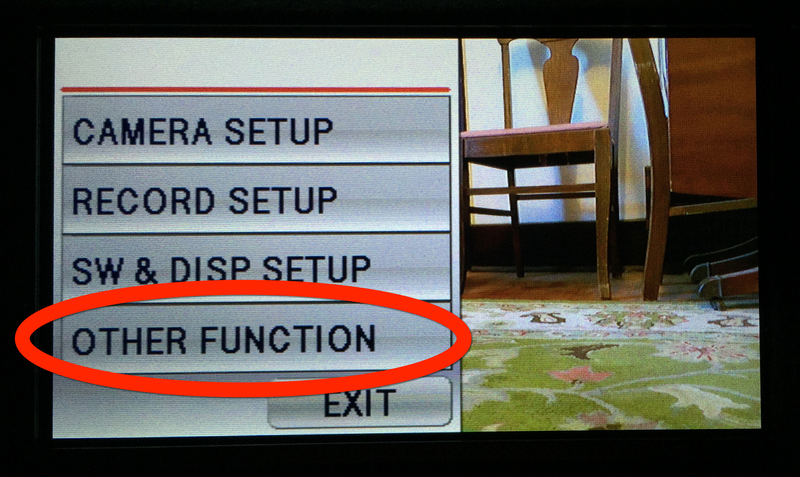 NOTE: If you can’s see the f-stop, you selected OFF in OTHER DISPLAY in the DISPLAY SETUP screen of the setup menus. When the iris is adjusted to brighter than OPEN the gain value changes, displayed as a number below the white balance indicator on the screen. The histogram and the Zebra button can help you find the correct exposure. Zebra button – Located on left side of camera. Press the Zebra once and it will show 80% brightness with zebra stripes. Press it twice, shows 100% brightness with zebra stripes. If you see zebra stripes, reduce the aperture, but watch the histogram. If there is a bright light in the shot, you might not be able to reduce zebra bars completely. Try to reposition camera to make adjustments with the zebra stripes, if possible. Use the manual focus if possible. Auto focus can often give unwanted results, focusing on the object, usually in the center. In some cases auto focus is a great selection if you have fast moving objects or shooting video of yourself. 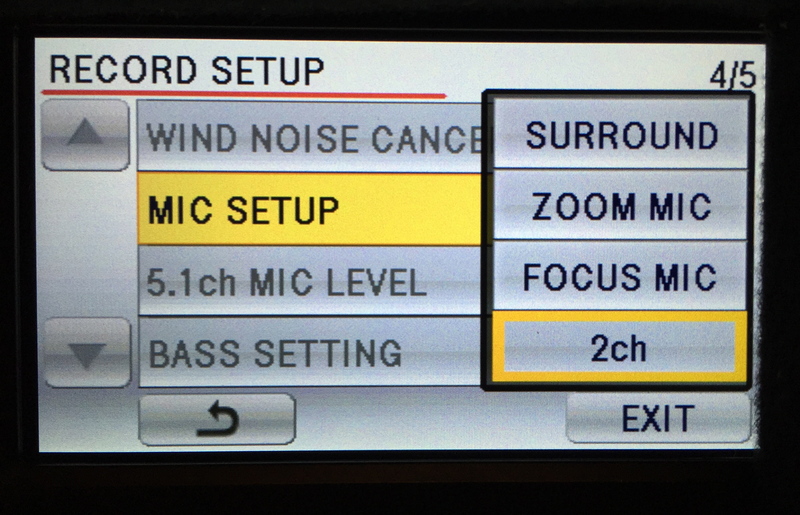 The FOCUS has two settings. Auto focus mode – The camera will focus on an object, usually in the center. Manual focus mode – Allows you to adjust the focus using the focus right, the ring that is the outer most on lens, next to the red line. Focus Assist – Find button on left side of camera, FOCUS ASSIT. Press the button, and the in-focus areas will be displayed in red. The normal display is restored in 10 seconds after the focus ring is used. This if helpful for manual focus. – You can zoom using the Zoom Rocker, the T and W switch on the top right of camera and using the zoom ring, middle ring. The zoom ring is faster than the rocker zoom. Zoom Rocker – Switch for telephoto and wide angles views located on the top of camera. 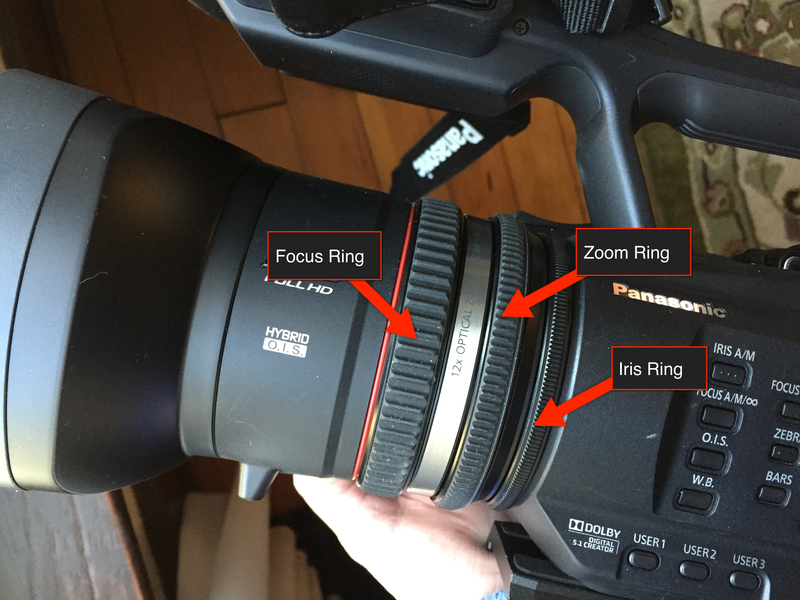 Can also use Zoom Ring, center ring, on lens for zoom. The image stabilizer reduces the shaking of the camera while recording. A series of prisms and gyros in the lens move and redirect the image coming into the lens and detect motion, compensating for camera wobble and motion. 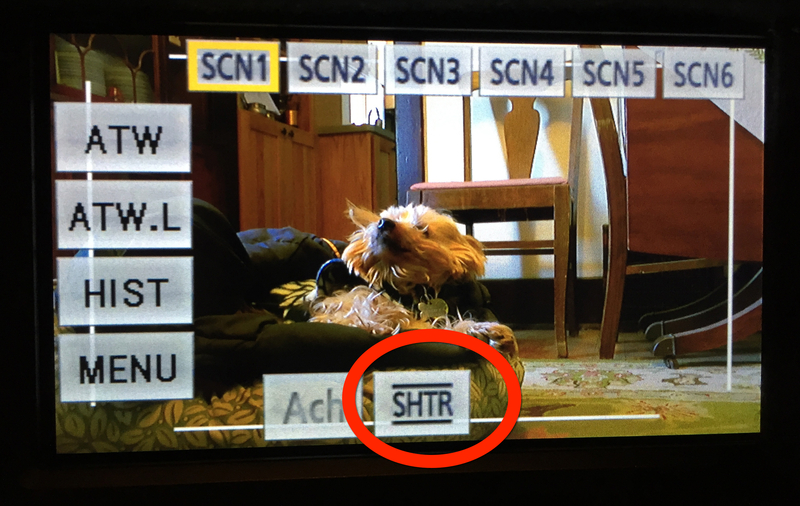 Set Image Stabilization, OIS – Press the OIS button on left side of camera to turn on or off. 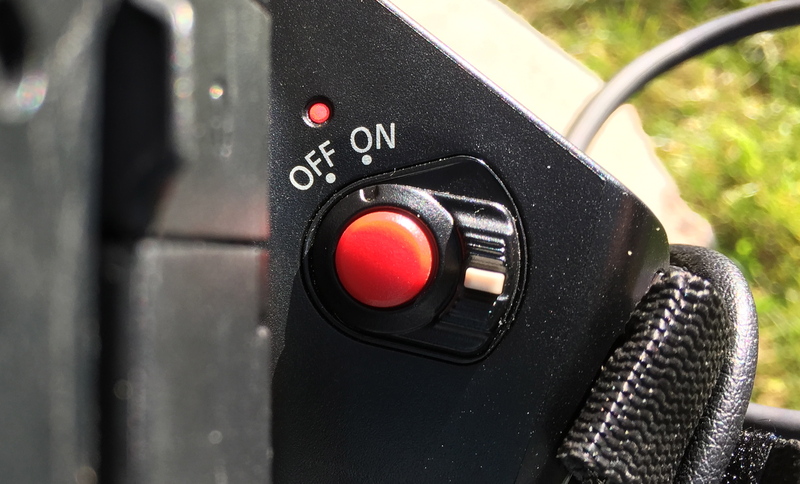 Don’t use OIS button when camera is mounted on tripod. 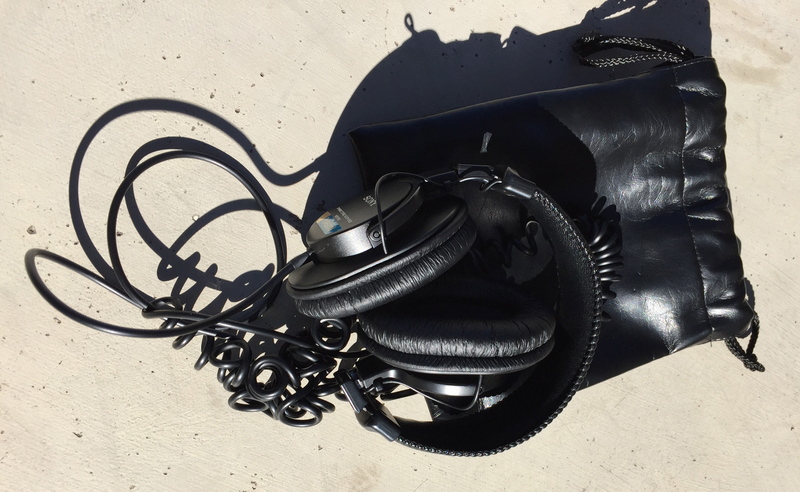 Headphone jack – ALWAYS use your headset to listen to the audio as it is recording. The jack is located rights side of camera, look for door with image of a headset. Built in microphone – You will not be using the built in microphone. Go to External Microphone for better quality audio. 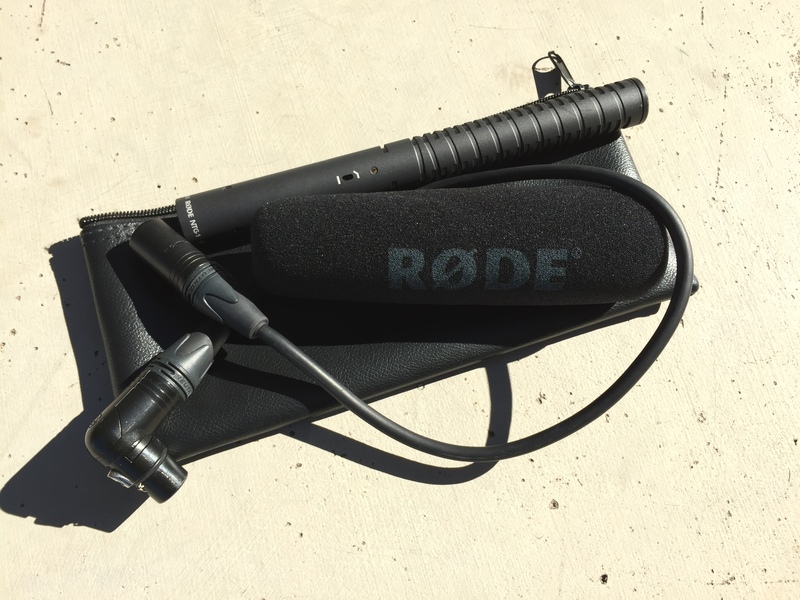 External microphone – Required The video kits come with a detachable shotgun mic and a handheld mic, higher quality than the built-in camera mic. MUST USE EXTERNAL MICROPHONE – If you are interviewing, recording a person talking or recording yourself talking, you MUST use an external microphone. 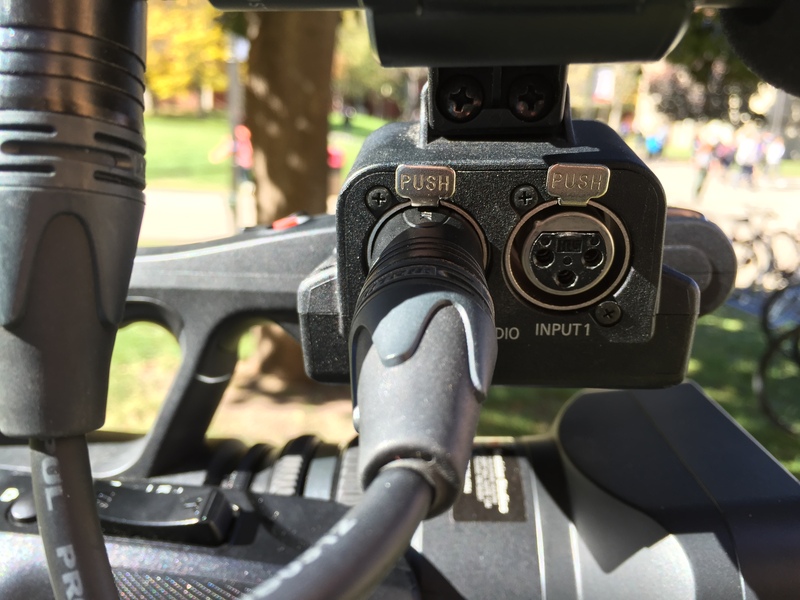 External Inputs – The camera has two external inputs for mic cords and lines. 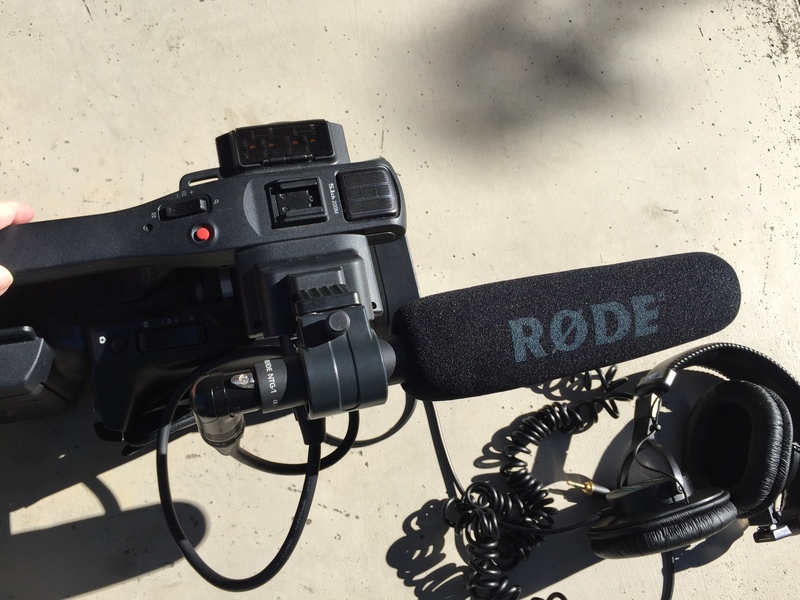 Located on right side of camera, XLR inputs for three prongs. Using one or two external microphones – If you are using one external microphone, plug into INPUT 2. Use both inputs if using two external microphones. Carefully place the windscreen on the mic. Use the mic cable and plug microphone into INPUT2, if only using one mic, or use both inputs for two mics. 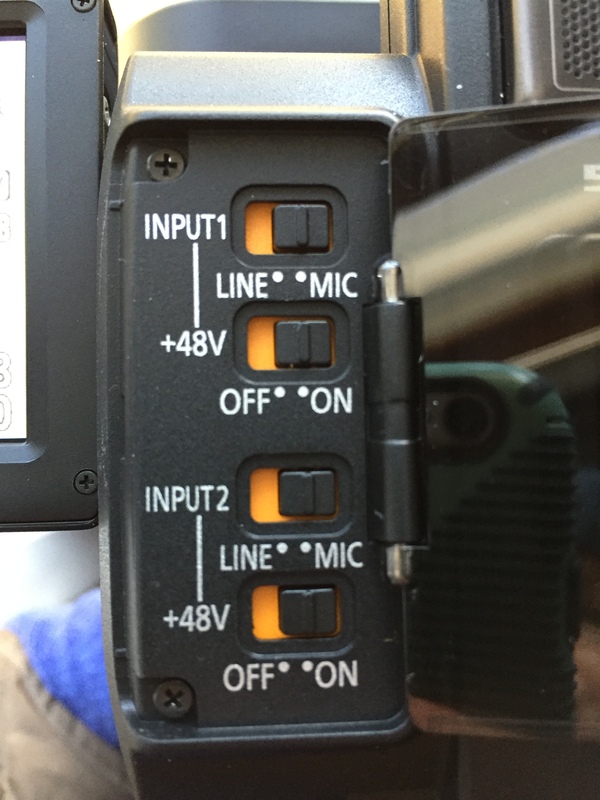 Make sure the LINE/MIC switches on the top of the camera, find little plastic window, are set to MIC and the phantom power switches set to +48V are switched to ON. Touch the LCD monitor, press MENU, Select RECORD SETUP, then MIC SET |UP, then 2CH. Audio Tracks – The camera records to two audio tracks, left and right. One microphone – If you only have one mic, plug mic into INPUT 2 and send it to both channels. This creates a dual-mono sound in video clip. Two microphones – If you have two microphones, send one to the left and one to the right. When you play back you video, the audio will be split between the left and right ears, but you can separate the channels and convert each to a dual-mono in Premiere. Set the channel switches to the correct inputs. 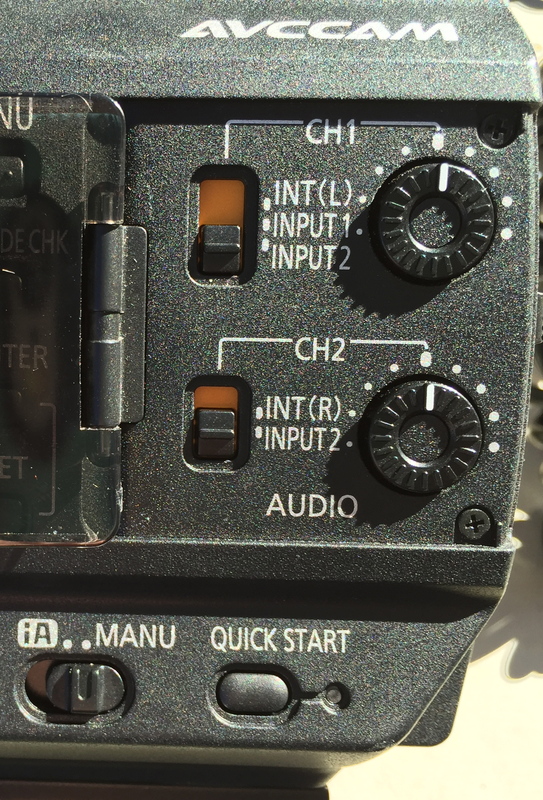 Use the AUDIO control knobs, left side of camera, under the little plastic window. Making adjustments: Turn the AUDIO control knob while referring to the audio level meter at the bottom left of the LCD monitor. ALWAYS USE YOUR HEADSETS and plug them into the camera to listen to the audio while shooting and adjusting audio levels. Camera must be mounted to tripod. Make sure the Image Stabilization, OIS, is OFF! Select the location to shoot time lapse, with a building and clouds, students walking on side walk between classes or another location. The idea is to show movement that is faster than reality. Make sure camera is solidly locked down, with no movements, checking the pan and tilt levers along with the tripod legs. If it is windy, you can add weights, rocks or book bags to help with stability. 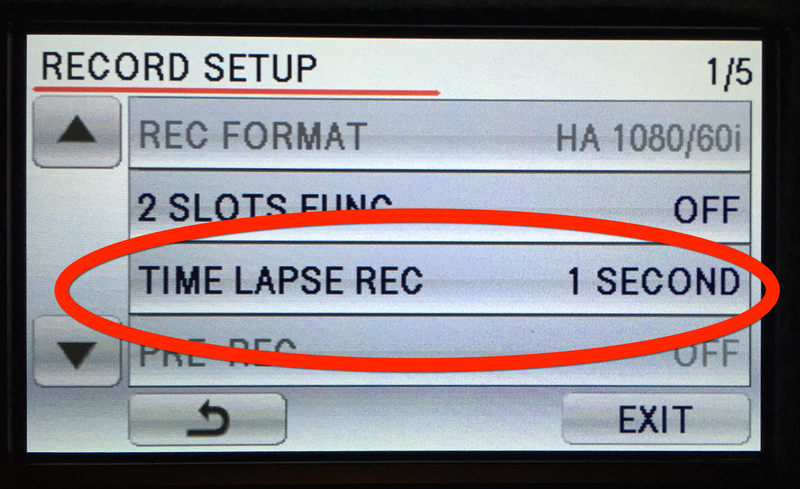 Select 1 second, NOT ONE MINUTE – this is the interval between clips. IMPORTANT – Shoot video for four minutes – YOU WILL NEED TO TIME your video for the timelapse. Use the timer on your iPhone or smartphone. This will give you about 15 second clip at 30 frames per second. 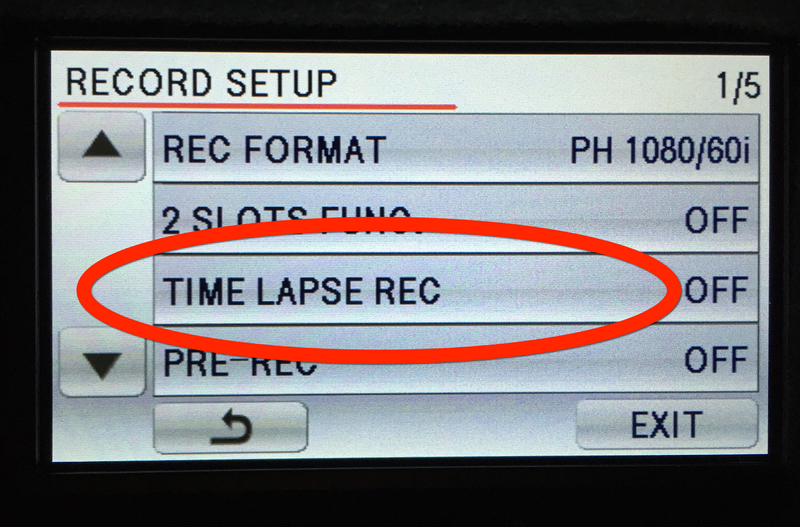 SHOOT more than one timelapse at least three or four to make sure you have a selection. 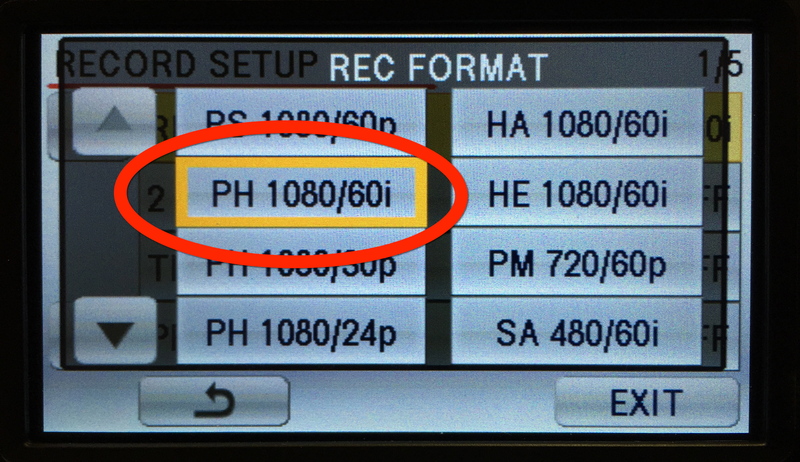 When done shooting timelapse, make sure you select PH 1080/60i to continue shooting video. 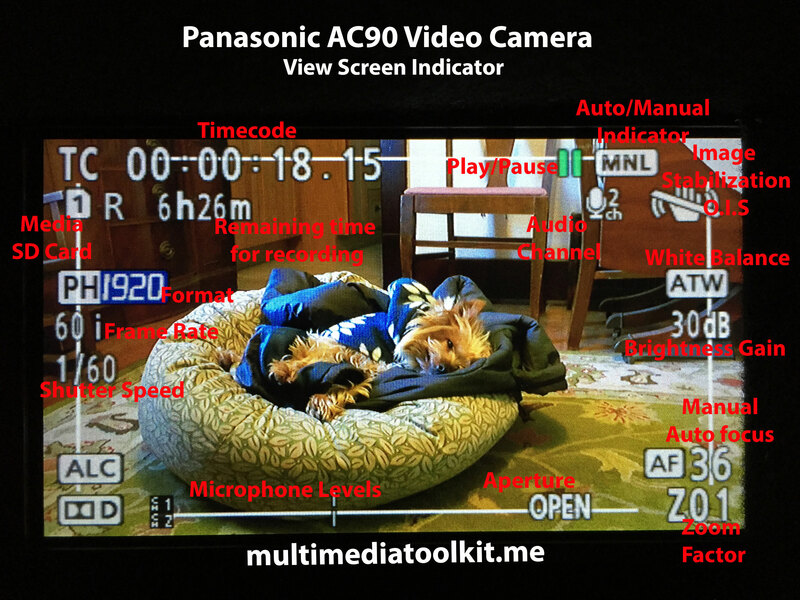 Posted in Panasonic AC90Tagged multimedia, Panasonic videoBookmark the permalink.